Tsakonian (also Tsaconian, Tzakonian or Tsakonic; Tsakonian: τσακώνικα, α τσακώνικα γρούσσα; Greek: τσακώνικα) is a modern Hellenic language which is both highly divergent from other spoken varieties of Modern Greek and, from a philological standpoint, is also linguistically classified separately from them. It is spoken in the Tsakonian region of the Peloponnese, Greece. Tsakonian descends from Doric, which was an Ancient Greek language on the Western branch of Hellenic languages, and it is its only living descendant (along with the debatable Maniot dialect of Modern Greek). Although Tsakonian is treated as a dialect of Modern Standard Greek, some compendia treat it as a separate language, since Modern Standard Greek descends from Ionic and Attic which are on the Eastern branch of the Hellenic languages, while Tsakonian (as a descendant of Doric) is the sole surviving member of the Western branch. Tsakonian is critically endangered, with only a few hundred, mostly elderly, fluent speakers left. It is partially mutually intelligible with Standard Modern Greek. It is named after its speakers, the Tsakonians, which in turn may be derived from 'exo-Laconians' 'Outer Lakonians'. Tsakonian is found today in a group of mountain towns and villages slightly inland from the Argolic Gulf, although it was once spoken farther to the south and west as well as on the coasts of Laconia (ancient Sparta). There was formerly a Tsakonian colony on the Sea of Marmara (or Propontis; two villages near Gönen, Vatika and Havoutsi), probably dating from the 18th century, whose members were resettled in Greece with the 1924 population exchanges. Propontis Tsakonian appears to have died out around 1970. Geographical barriers to travel and communication kept the Tsakonians relatively isolated from the rest of Greece until the 19th century, although there was some trade between the coastal towns. The rise of mass education and improved travel beginning after the Greek War of Independence meant that fluent Tsakonian speakers were no longer as isolated from the rest of Greece. In addition, during the war, the Turkish army drove the Tsakonians east, and as a result, their de facto capital shifted from Prastos to Leonidio, further making the people significantly less isolated. There began a rapid decline from an estimated figure of some 200,000 fluent speakers to the present estimate of a speaker count between 200 and 1,000. Since the introduction of electricity to all villages in Tsakonia by the late 1950s, the Greek mass media can reach the most remote of areas and profoundly affect the speech of younger speakers. Efforts to revive the language by teaching it in local schools do not seem to have had much success. Standard Modern Greek is the official language of government, commerce and education, and it is possible that the continued modernization of Tsakonia will lead to the language's disappearance sometime this century. The area where the language is found today in some villages Tsakonia slopes of Parnon in the southern province of Kynouria, including the towns of Leonidio and Tyros and villages of Melana, Agios Andreas, Vaskina, Prastos, Sitaina and Kastanitsa. Tsakonian has no official status. Prayers and liturgies of the Greek Orthodox Church have been translated into Tsakonian, but the ancient Koine of the traditional church services is usually used as in other locations in Greece. Some teaching materials in Tsakonian for use in local schools have reportedly also been produced. Tsakonian is divided by scholars into three dialects, Northern Tsakonian, Southern Tsakonian and Propontis Tsakonian. Another difference between Tsakonian and the common Demotic Greek dialect is its verb system – Tsakonian preserves different archaic forms, such as participial periphrasis for the present tense. Certain complementisers and other adverbial features present in the standard Modern Greek dialect are absent from Tsakonian, with the exception of the Modern που (/pu/) relativiser, which takes the form πφη (/pʰi/) in Tsakonian (note: traditional Tsakonian orthography uses the digraph πφ to represent aspirated /pʰ/). Noun morphology is broadly similar to Standard Modern Greek, although Tsakonian tends to drop the nominative, final -ς (-s) from masculine nouns, thus Tsakonian ο τσχίφτα for Standard o τρίφτης (o tshífta/o tríftis: "grater"). (Tsakonian/Greek) "Our language is Tsakonian. Ask and they'll tell you./Groússa námou eíni ta Tsakónika. Rotíete na nioúm' alíoi./I glóssa mas eínai ta Tsakónika. Rotíste na sas poun. 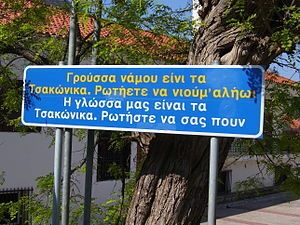 ", bilingual (Tsakonian and Standard Greek) sign in the town of Leonidio. The Propontis dialect was much more heavily influenced by the modern Thracian dialect, and although there were significant grammatical differences, its vocabulary was much closer to Standard Modern Greek. Compare the Northern and Southern word for water, ύο (ýo, derived from Ancient Greek ὕδωρ) to Propontic νερέ and Standard νερό (neré, neró). However, there has always been contact with Koine Greek speakers and the language was affected by the neighboring Greek dialects. Additionally, there are some lexical borrowings from Arvanitika and Turkish. The core vocabulary remains recognizably Doric, although experts disagree on the extent to which other true Doricisms can be found. There are only a few hundred, mainly elderly true native speakers living, although a great many more can speak the language less than fluently. A [a] can appear as a reflex of Doric [aː], in contexts where Attic had η [ɛː] and Modern Greek has [i]: αμέρα [aˈmera] corresponding to Modern ημέρα [imera] "day", στρατιώτα [stratiˈota] corresponding to Modern στρατιώτης [stratiˈotis] "soldier". Ε [e] [i] before vowels: e.g. Βασιλήα [vasiˈlia] instead of βασιλέα [vasiˈlea]. Υ Pronounced in Modern Greek [i], this was [u] in Doric and [y] in Attic. The reflex of this phoneme in Tsakonian is [u], and [ju] after coronals (suggesting an origin in [y]). σούκα [ˈsuka] corresponding to Modern σύκα [ˈsika] "figs", άρτουμα [ˈartuma] corresponding to άρτυμα [ˈartima] "bread"; λύκος [ˈlykos] > λιούκο [ˈljuko] [ˈʎuko] "wolf"
Ω [ɔː] in Ancient Greek, regularly goes to [u]: μουρήα [muˈria] (Ancient μωρέα [mɔːˈrea], Modern μουριά [murˈja]), αού [au] < λαλών [laˈlɔːn] "speaking". Tsakonian in some words preserves the pre-classical Greek [w]-sound, represented in some Ancient Greek texts by the digamma (ϝ). In Tsakonian, this sound has become a fricative [v]: βάννε [ˈvane] "sheep", corresponding to Ancient ϝαμνός [wamˈnos] (Attic ἀμνός). [r] > [ʒ] : ρυάκι [ryˈaki] > ρζάτζι [ˈʒatɕi]. This sound appears to have been a fricative trill in the 19th century, and [ʒ] survived latterly only in women's usage in Southern Tsakonian. A similar change occurred with palatalised [rʲ] in Polish and Czech, whereas in other languages it went in the reverse. ἑσκανταλίστε τὁ κουιβί τσ' ἑφύντζε μοι τ' αηδόνι. Τσ' ἁφέγκι νι ἔκει τσυνηγού μὲ τὸ κουιβί τθὸ χέρε. να ἄτσου τὰ κουδούνια ντι νἁ βάλου ἄβα τσαινούρτζα. eskantalíste to kouiví ts' efíntze mi t' aïdóni. na átsou ta koudoúnia nti na válou áva tsenoúrtza. Πουλάκι είχα στο κλουβί και μερομένο το είχα. eskantalísti ke to klouví ke mou éfige t' aïdóni. n' allákso ta koudoúnia sou na válo álla kenoúrgia. it got naughty [possibly means it got drunk] and escaped. I will remove your old bells and buy you new ones. Tsakonian avoids consonant clusters, as seen, and drops final [s] and [n]; as a result, syllable structure tends more to CV than in Standard Modern Greek. (The use of digraphs in tradition spelling tends to obscure this). For instances, ancient [hadros] "hard" goes to Tsakonian [a.tʃe], where /t͡ʃ/ can be considered a single phoneme; it is written traditionally with a trigraph as ατσχέ (= atskhe). Tsakonian has undergone considerable morphological simplification: there is minimal case inflection. The present and imperfect indicative in Tsakonian are formed with participles, like English but unlike the rest of Greek: Tsakonian ενεί αού, έμα αού "I am saying, I was saying" ≈ Greek ειμί λαλών, ήμην λαλών. Note: (K) is for the northern dialect of Kastanitsa and Sitaina, (Λ) and (L) for the southern which is spoken around Leonidio and Tyros. Don't touch me there! Μη μ' αγγίζεις εκεί! Μη' μ' αντζίτζερε όρπα! Mē' m'adzíchere órpa! Μαν με ατζ ̌ίτζερρε όρπα! ^ "Tsakonian". Ethnologue. Retrieved 2018-03-13. ^ Hammarström, Harald; Forkel, Robert; Haspelmath, Martin, eds. (2017). "Tsakonian". Glottolog 3.0. Jena, Germany: Max Planck Institute for the Science of Human History. ^ Browning, Robert (1983). Medieval and modern Greek. Cambridge: Cambridge University Press. p. 124. ^ Horrocks, Geoffrey (2010). Greek: A history of the language and its speakers (2nd ed.). Oxford: Blackwell. p. 382. ^ Joseph, Brian D.; Terdanelis, Georgios (2003). "Modern Greek". In Roelcke, Thorsten. Variation typology: a typological handbook of European languages. Berlin: de Gruyter. pp. 823–836. Joseph, Brian D. (2012). "Lexical diffusion and the regular transmission of language chang in its sociohistorical context". In Hernández-Campoy, Juan Manuel; Conde-Silvestre, Juan Camilo. Handbook of historical sociolinguistics. Oxford: Blackwell. p. 411. ^ a b c d e Moseley, Christopher (2007). Encyclopedia of the world's endangered languages. New York: Routledge. s.v. "Tsakonian". ^ Mansfield, Peter (April 21, 2000). "Letter from Tere-Sapunadzi". TLS. Times Literary Supplement. ^ P. Trudgill, D. Schreier (2006): Greece and Cyprus. In: U. Ammon (ed. ), Sociolinguistics. Berlin: Mouton de Gruyter. ^ This song in its original (polytonic) Tsakonian form is taken from a book called «ΚΛΕΦΤΙΚΑ ΔΗΜΟΤΙΚΑ ΤΡΑΓΟΥΔΙΑ» (KLEPHTIC DEMOTIC SONGS) by N. G. Politou. It can be found in the last few pages of the book under the «ΤΡΑΓΟΥΔΙΑ ΕΙΣ ΕΛΛΗΝΙΚΑΣ ΔΙΑΛΕΚΤΟΥΣ» (SONGS IN GREEK DIALECTS) section on page 269. Costakis, Athanasios (Thanasis) P. (1951). Σύντομη Γραμματική της Τσακωνικής Διαλέκτου (Brief Grammar of the Tsakonian Dialect). Athens: Institut Français d'Athènes. Horrocks, Geoffrey (2014). Greek: A history of the language and its speakers, 2nd ed. Hoboken, NJ: Wiley Blackwell. ISBN 1-118-78515-0. Nicholas, Nick (1999). "The Story of pu: The grammaticalisation in space and time of a Modern Greek complementiser". Final. Archived from the original on 2012-12-12. Pernot, H. (1934). Introduction à l'étude du dialecte tsakonien. Paris.